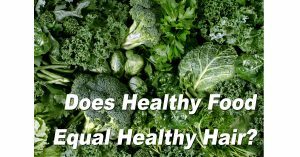 Does Healthy Food Equal Healthy Hair? There are many things that can lead to thinning hair and hair loss. A very common condition is called androgenetic alopecia, which is also known as male or female pattern hair loss. Genetics play a big factor, as can scarring, and reactions to medication. Not every cause is immediately obvious. For example, some might be surprised to learn that there’s a connection between stress and thinning hair. You also might not know that there is a connection between eating healthy food and having healthy hair. At RHRLI, we believe that understanding issues such as the impact diet have on hair loss and thinning hair can lead to a better understanding of your hair treatment options. Please note that the author of this piece is not a doctor and the information of this material is not intended medical advice. Please consult your doctor or medical professional for specific information regarding your individual situation. A bad diet does sometimes contribute to hair loss. This can especially occur when someone decides to go on a crash diet or follows a “fad” diet. Conversely, eating a healthy, balanced diet is key to making your head of hair as healthy as possible. According to the website WebMD, your hair needs all the recommended vitamins, minerals, and nutrients that the rest of your body needs. The key to having healthy hair which doesn’t break and appears shiny can be related to the types of food you eat. A key diet component that impacts hair health is protein. Hair is mostly made up of protein and requires it to grow. If you’re not getting enough protein in your diet, it can cause you to shed hair earlier than you normally would in a healthier hair growth cycle. While protein is very important, it should be noted that most people eat enough protein to have healthy hair. However, vegetarians and vegans might want to contact a dietician to ensure they have enough in their diet. Another important nutrient for healthy hair is iron. Iron helps red blood cells carry oxygen to hair follicles. Not having enough iron can lead to hair loss. Chicken, fish and red meat are excellent sources of iron. Vegetarians can increase their iron levels by eating green leafy vegetables such as spinach, kale or broccoli. Lentils can be a great source of iron as well. Other minerals such as zinc, selenium, copper or magnesium can also give a boost to hair health. Several vitamins can also contribute to strong, healthy hair. According to BBC Goodfood, vitamin A helps your body produce sebum, an oily substance that acts as a natural conditioner. It prevents itchy scalps and dry hair. Carrots, pumpkin, and sweet potatoes are high in vitamin A. Vitamin B deficiency can cause people to lose hair, but such deficiencies are rare in the US. NBC’s Today Show points out that there’s no clear evidence that taking biotin, a vitamin of the B complex, helps. Vitamin C aids in the absorption of iron. It can be found in broccoli, oranges, blueberries, and kiwi. There is evidence that vitamin D may play a role in hair health. Many Americans don’t get enough vitamin D, but there is controversy over how much vitamin D should be prescribed, according to WebMD. This is a question you should ask your doctor. Vitamin E, found in many nuts, can help protect your skin against sun damage. Omega-3 fatty acids are found in cells that protect the scalp, according to BBC Goodfood. Your body doesn’t produce them, so they need to be obtained from dietary sources. Fish such as salmon, trout, and sardines are high in Omega-3. RHRLI wants you to eat a healthy diet and doing so can help with thinning hair or hair loss. We also want you to know that we can help you find a permanent solution. We are the only hair loss treatment center on Long Island to offer the ARTAS® Robotic Hair Transplant System. This state of the art system can provide minimally invasive hair transplants and leave you with a healthier head of hair. Contact us today for a free consultation. Previous Post: « Can a “Man Bun” Lead to Hair Loss?